Want to go to WES 2010 but don't have the $$ to buy a ticket? Zenprise is giving you the chance to win one! RIM's big annual show, the Wireless Enterprise Symposium for BlackBerry Users (or WES) is coming up April 27th to 29th in Orlando, Florida. It's an enterprise/industry show rather than a consumer one, but it's always a great show and an awesome time. The only bad thing about WES is getting there - if you miss the early bird special, conference passes run for $1799. Fortunately, the folks at Zenprise let us know about a little contest they're running that will give one lucky winner a free pass to attend WES and even up to $500 to cover air travel. 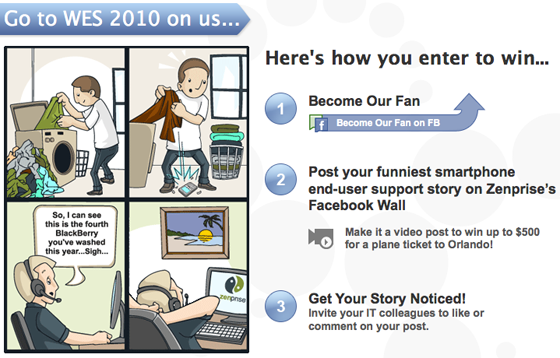 To enter, simply become a fan of the Facebook Zenprise page and write your funniest end user smartphone support story on the wall. If you decide to do a video post and win, they'll also reimburse the winner up to $500 for air travel. Be sure to jump over the fan page for full details. Bla1ze, Adam and myself will be at WES 2010 this year so if you're a CrackBerry reader and end up winning be sure to let us know. We can meet up for a roundof Campari (on Adam.. suckah! ).